What are you going to do with that jack-o-lantern? Use it? Compost it? Toss it? One of my favorite ways of eating pumpkin is pumpkin soup. 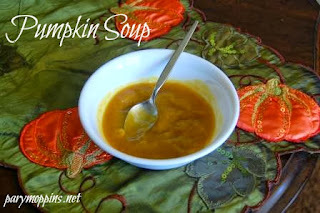 Here is my super easy recipe for pumpkin soup. Go once around the pot with olive oil. Saute onions, garlic, and spices until tender and fragrant. Add pumpkin puree and stock. Stir well. Heat through. Add salt & pepper to taste. See, I told you it was super easy. It's very tasty served with naan bread but this batch was served with Beerscotti. This is part of Full Plate Thursday, See Ya in the Gumbo, and Coco & Cocoa. I've been looking for a good pumpkin soup recipe!! Thanks for sharing! I hope you enjoy it Ms. Julie! I've never made pumpkin soup. Thanks for the recipe! You are so welcome. I love it as a quick meal. Your Pumpkin Soup looks delicious, perfect for our colder weather. Hope you are having a great day and thank you so much for sharing with Full Plate Thursday! Quick & easy is all I can manage some nights which makes this a perfect healthy supper. Thanks for stopping by! I've never made or even had pumpkin soup. I like all of the spices you have going on--bet it is very fragrant. Thank you for stopping in and linking this week! I really like pumpkin soup and have made it all sorts of ways, with cream or apples or a different spice profile, but I like this recipe best because of the Indian flavors, which are indeed, very fragrant. You are so right Ms. Carole! I had puree in my freezer that needed to be used so that's what I used here but if you are starting this recipe with a fresh pumpkin then roasting it is fabulous.